The Energy Development Corporation (EDC) commissioned the 150MW Burgos wind project in November 2014. The $450m Burgos wind farm had its ground-breaking ceremony in April 2013. The wind farm consists of 50 Vestas V90-3.0MW wind turbines. The 150MW Burgos wind farm in Ilocos Norte is the biggest wind farm in the Philippines and the first wind project nominated for the Philippine Government’s feed-in-tariff (FIT) incentive scheme. The onshore wind farm was commissioned in November 2014 and is owned and operated by the EDC Burgos Wind Power Corporation (EBWPC), an affiliate of Energy Development Corporation (EDC). Development included the 87MW first phase and the 63MW second phase. The ground-breaking ceremony was held in April 2013 and the construction works began in June of the same year. The wind farm is expected to generate approximately 370GWh of electricity a year, which will be used to power more than two million households, while offsetting approximately 200,000t of CO2 emissions annually. "The first phase included the installation of 29 wind turbines and the construction of a wind farm substation." The Burgos wind project is located approximately 500km north of Manila, in more than 686ha, covering Saoit, Nagsurot and Poblacion barangays within the Municipality of Burgos in Ilocos Norte Province, northern Philippines. The Philippine Department of Energy (DOE) nominated the project to the country’s Energy Regulatory Commission (ERC) as an eligible project under the FIT programme, which allows a renewable energy development company to receive guaranteed payments from the ERC on a fixed rate per kilowatt-hour basis. Burgos consists of 50 Vestas V90 wind turbines with a rated capacity of 3MW each. The first phase included the installation of 29 wind turbines and the construction of a wind farm substation, access roads and a 42km overhead transmission line. The remaining 21 turbines were installed in the second phase. Each wind turbine rests on a tubular steel tower, has a 75m hub height and 90m rotor diameter and offers a swept area of 6,326m². The wind turbine generators are expected to have an average life period of 20 years. Approximately 630m³ of concrete was used for the construction of foundations for each wind turbine tower. Power from the substation is sent via a 115kV single-circuit overhead transmission line to the National Grid Corporation of the Philippines (NGCP) Substation in Laoag City, from where it is then transmitted to the Luzon grid. The 43km-long transmission line to the Laoag substation passes through the Burgos, Pasuquin, Bacarra and Laoag municipalities, and consists of 147 structures, including 127 lattice steel towers and 20 steel poles. "The onshore wind farm was commissioned in November 2014 and is owned and operated by the EDC Burgos Wind Power Corporation (EBWPC)." The cost of the Burgos wind farm was estimated at $450m. EDC secured $315m debt financing from a group of foreign and local banks in October 2014. This debt financing facility consists of US dollar and Philippine peso tranches, which will expire in 15 years. Danish export credit agency, Eksport Kredit Fonden (EKF), provided a guarantee for a portion of the US dollar loan component and the Australia and New Zealand Banking Group (ANZ), DZ Bank, the ING Bank, Malayan Banking Berhad (Maybank), and Norddeutsche Landesbank Gironzentrale, acted as mandated multiple lead arrangers for the foreign tranche. The local tranche for the loan facility was arranged by PNB Capital and Investment Corporation and SB Capital Investment Corporation, along with a group of local lenders including BDO Unibank, Land Bank of the Philippines, Philippine National Bank and Security Bank Corporation. 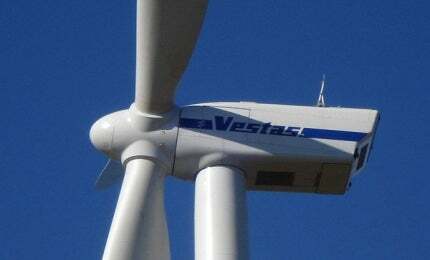 Denmark-based Vestas Wind Systems supplied and installed 50 V90-3.0MW turbines for the project. The company also provided associated on-site civil and electrical works for the project, and will operate and maintain the wind farm under a ten-year operations and maintenance (O&M) agreement. First Balfour was sub-contracted by Vestas for the civil works of the 87MW first phase. The company was also contracted by the EDC for the detailed engineering, design, construction and installation of the 43km-long, 115kV overhead transmission line.